3 men of Italian nationality were arrested following a Police operation that resulted in a raid on an Ibiza Smoking Club. Smoking clubs, where members can smoke cannabis on the premises, operate in an area of Spanish law that is grey at best. There are past cases of organisers and authorities alike complaining that the rules for their operation are not fully defined. This can then lead to situations where the interpretation of the law can differ significantly from one case to the next. However, in this latest Ibiza Smoking Club bust the police are stating that the rules were being broken clearly and routinely. The smoking club is situated in San Jordi. The national Police put an operation, named Tapa-Tapa, in place when they were alerted to the club being used to sell Marijuana commercially. Their observations recognised that three members of the club had electronic keys that allowed them access to the various parts of the club, however they also concluded that the club was in effect a Marijuana Supermarket. The Police said that anybody was allowed access to the club and allowed to buy Marijuana in bud form, as hashish, or in ready made joints. The premises included a small bar, and various exhibitions offering different types of Cannabis for sale. The displays included the Cannabis and information in text and on digital screens, including the price per gramme. 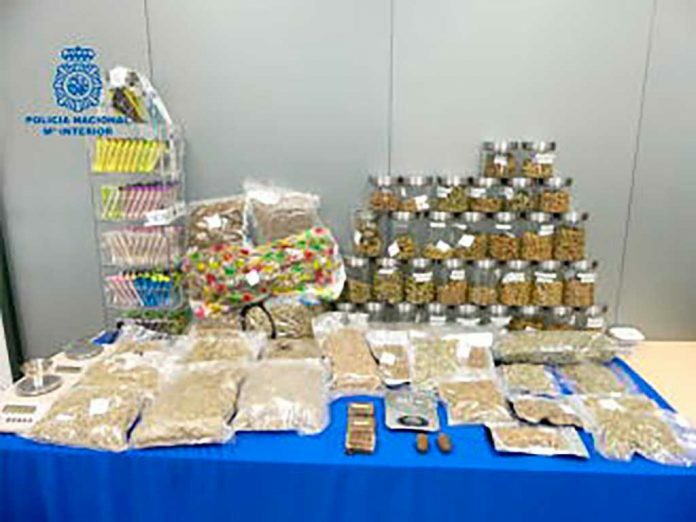 The National Police operation resulted in the arrest of three individuals, and following searches of the business premises and two further addresses they seized 8.7kg of Marijuana, 2.1kg of hashish, 377 euros in cash, 300 ready prepared joints, “porros” in Spanish, and diverse material such as precision and weighing scales, presses and other related utensils for the preparation of these substances. Likewise, a vehicle belonging to one of the detainees was searched, and almost 6 kilograms of marijuana packed in vacuum bags was found in the boot. In a statement issued after the arrests, Police said “With the arrests and seizures, it has been possible to neutralise a point of sale and consumption of a narcotic substance that operated as a private place to sell and consume marijuana and hashish”. Though the police information made it clear that the club had broken the rules on sale and membership, there was no mention of drugs being sold to people who took them off the premises.